Tesco has put further distance between itself and its competitors over the past three months, according to the industry's leading sales survey. Its share of UK supermarket sales rose to 30.6% in the 12 weeks to 29 January, up from 30.5% in the previous quarter, according to market research firm TNS. Tesco has had a successful year - its market share up from 29% a year ago. The latest figures also revealed that Sainsbury's is continuing to make up ground on second-placed Asda. Sainsbury's market share rose from 16.2% to 16.3% over the period, while Asda's inched down from 16.7% to 16.6%. Sainsbury's fortunes have improved significantly over the past year under the leadership of chief executive Justin King. A year ago Sainsbury's was lagging its rival - owned by the US retailer Wal-Mart - by a full 1%. 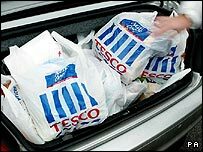 "Whilst Tesco remains dominant there are signs that it is experiencing increased competition," said Edward Garner, a TNS spokesman. "It is still growing, but the year-on-year share increase is below the average we were seeing last year." Morrison's market share fell from 11.3% to 11.1% over the period, having begun the start of 2005 at 12.4%. The firm has endured a difficult time since its purchase of Safeway in 2004 and has been squeezed by its rivals.